This all-in-one garden kit includes everything you need to grow terrific vines. Cucumbers, peas, pole beans and other vine crops will reach for the sky and reward you with a lavish, easy-to-harvest bounty. Or plant annual flower vines like sweet peas, mandevilla and black-eyed Susan vines and delight in an exuberant tower of lush foliage and dramatic color. The classic clapboard style complements a variety of locations. We recommend using the included tie-backs to secure the planter to a post or railings. Success starts in the roots. The perforated planter with sidewall ventilation and lightweight Grow Bag liner air-prune roots, ensuring a dense, vigorous root system that can take up more water and nutrients — the secret to super-productive plants.Dual-Hydrate Watering System. Draws water from the reservoir into the soil two ways — an evaporative grid plus capillary strip — efficiently providing roots with water. And the large water reservoir provides consistent moisture and reduces watering chores.Built-in support. The heavy-duty trellis is integrated into the planter, giving vines a secure place to climb.Large capacity. The planter holds a generous 60 quarts of potting mix to accommodate multiple plants and encourage extensive root systems. Success starts in the roots.�The perforated planter with sidewall ventilation and lightweight Grow Bag liner air-prune roots, ensuring a dense, vigorous root system that can take up more water and nutrients � the secret to super-productive plants. Dual-Hydrate Watering System.�Draws water from the reservoir into the soil two ways � an evaporative grid plus capillary strip � efficiently providing roots with water. And the large water reservoir provides consistent moisture and reduces watering chores. Built-in support.�The heavy-duty trellis is integrated into the planter, giving vines a secure place to climb. Large capacity.�The planter holds a generous 60 quarts of potting mix to accommodate multiple plants and encourage extensive root systems. 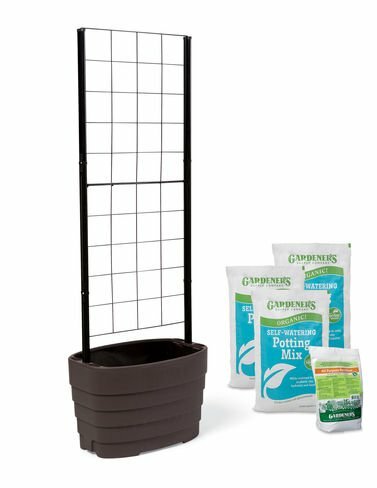 Kit includes Classic Planter, integrated 55-3/4" high vine trellis, three 20-qt. bags of our premium Organic Self-Watering Potting Mix and 5 lbs. of our GSC Organic All-Purpose Fertilizer.